You may (or may not) be asking yourself how our new application, Map Mavin, differs from ArcGIS. At the heart of it, we function in much the same way. We both allow GIS users to share maps. Pretty cool, right? ArcGIS is the leader in the US market and they have tons of functions in their desktop application. But not everyone has the need or available cash to buy a license for ArcGIS. That’s where ArcGIS Online comes in. For a more affordable price, you can use their online version. The catch here is that in order to view a private map your users also need to buy a subscription. Let’s say you have 50 people in the field, all recording data. Each field worker needs a subscription or they have to record the data elsewhere for the admin to enter it later. That means more work for you. With Map Mavin, Map Viewers are free – always. As an online application, Map Viewers can access your private web maps on any computer without expensive software. Map Viewers can edit data or they can be restricted to view only. Map Mavin also has Screen Share and chat, so your users can collaborate in real time on any project. At the crux of Map Mavin is usability. Your time is precious and you shouldn’t spend it on training. Map Mavin is easy to use. No long training sessions needed. Our support team is available at the drop of a hat to help you out. We are a small company looking for ways to offer the best service to our clients. With that, comes flexibility. You want a feature we don’t have? Let us know and we’ll get working on it. 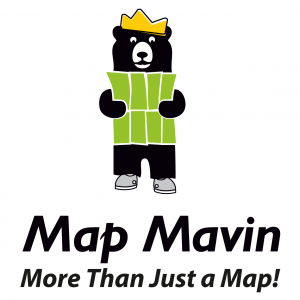 Map Mavin is not a replacement for ArcGIS. Map Mavin fits in the gaps that ArcGIS left behind. We are here for the everyday user, the hobbyist, and the professional that is just trying to share their data without strings attached. Would you like to see how Map Mavin could prove useful for your needs? Why don’t you take a look and see for yourself! Check out this map of New York City’s Public Wi-Fi Hotspots. Making maps like this one takes only minutes and can be done without any background in cartography. So what are you waiting for? Try Map Mavin today! And if you have any questions about Map Mavin, shoot us an email. This entry was posted in The Geospatial Times and tagged ArcGIS, Map Mavin, monthly spotlight, The Geospatial Times by Apollo Mapping. Bookmark the permalink.